Anyone shopping for dehumidifiers usually have two things at the forefront of their minds; high water extraction rate and large tank capacity. So when units like the ProBreeze 500ml Mini Air Dehumidifier come along, not many people pay attention. Is overlooking small tank capacity dehumidifiers a smart shopping strategy or should these units be taken more seriously? Truth be told, low tank capacity in a dehumidifier is not a small downside. It means frequent emptying of the dehumidifier and less than average performance in areas where humidity levels are too high. However, that does not mean you should automatically dismiss small dehumidifiers. These compact units come with some pretty attractive advantages as well. To begin with, they are sold at affordable prices (with the ProBreeze 500ml unit going for about £40 at the time of writing). Besides being cheaper than the bigger models, small tank dehumidifiers are more portable. Their lower volume also means they are low on power consumption and thus save you a ton of money overall. And contrary to popular belief, these units tend to pack a punch when tackling humidity in the home if used correctly. You will find all of these benefits and more with the ProBreeze 500ml Mini dehumidifier whose inner workings we dissect below. 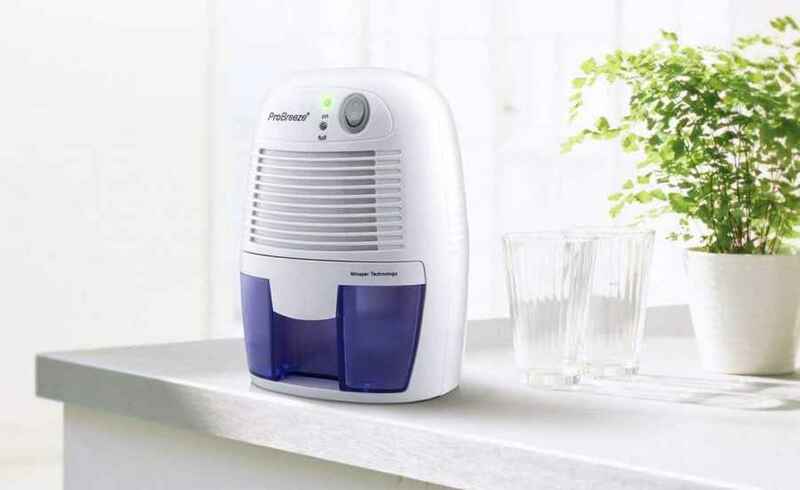 The ProBreeze 500ml unit is a mini dehumidifier and has the build to go with the title. Measuring in at 6 inches in length and just 8.5 inches high, it is the smallest dehumidifier we have encountered thus far. It is also the lightest, weighing a little under 1.5 kilos. With this small a size, there is no need for the carry handle and castor wheels (both not present) which are found in some of the bigger models since you can literally carry the dehumidifier in one hand. The small build makes it possible for you to place the ProBreeze 500ml anywhere. You can set it on a shelf in the bathroom, kitchen counter, the nightstand in your bedroom, the inside of a wardrobe where dampness is an issue, or even on a windowsill to eliminate condensation. The dehumidifier has rubber feet that ensure it remains firmly in place wherever it is set down. Unfortunately, there are no different built-in modes to choose from because an option for adjusting the dehumidifier’s humidistat is lacking. This ProBreeze Mini only has one pre-set function accessed via a solo ON/OFF switch button, which makes up the unit’s controls. Dehumidifiers usually include the water extraction rate of a unit in its name (e.g. the DeLonghi DX10, Meaco 12L-AH, Eco Air Arion 26L, etc). For this unit, however, the 500ml in the title stands for the unit’s tank capacity. It is a common marketing strategy for manufacturers of the smaller dehumidifier to state the tank capacity instead of extraction rate (especially if the former is larger than the latter). Under normal circumstances, a low 500ml water tank capacity would be a downside. More so since there is no connection for a drainage hose with this unit. However, there is a bit of a positive aspect of this low-tank-capacity-no-drainage-hose situation. When pulled out, the tank is completely covered and features a plug (like the one you would find in a bathroom sink drain) which you pull out and then tilt the tank to pour out the water. 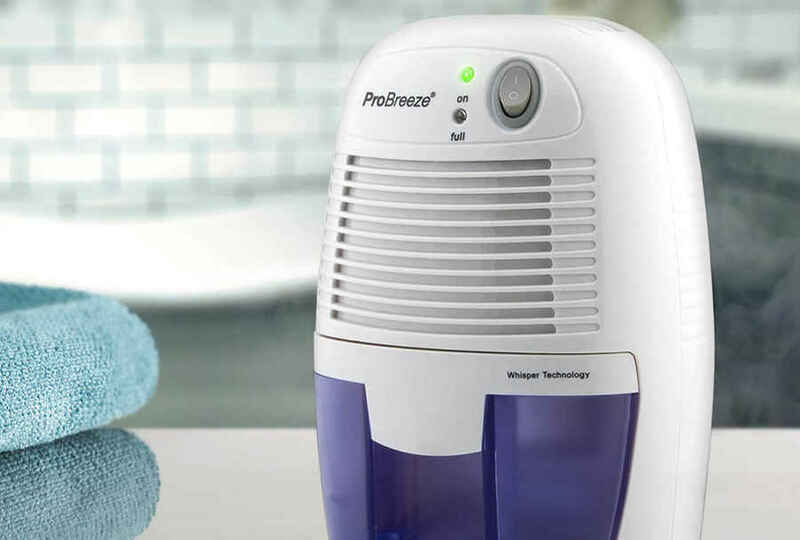 The 500ml tank is double the size of the amount of water this ProBreeze Mini dehumidifier is designed to extract every day. Therefore, you should be able to go a straight 48hous before you need to empty the tank, assuming that you collect the stated amount. The actual emptying process is made easy by a uniquely designed tank. 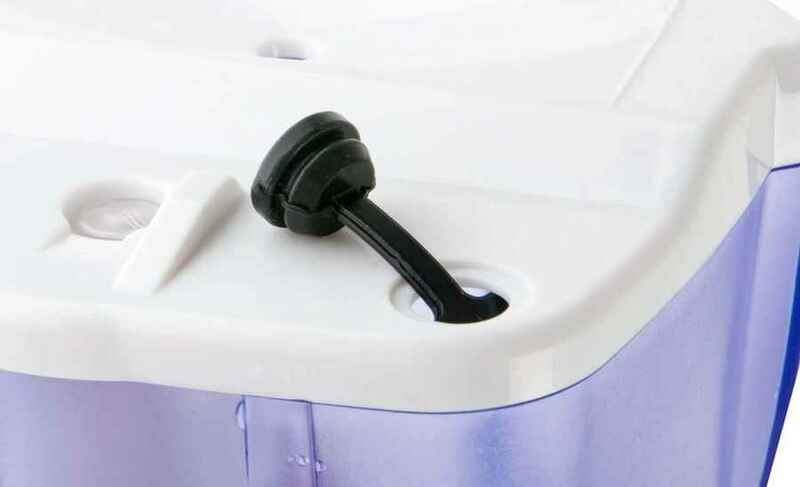 The tank has an indented handle that allows you to pull out (and push back) smoothly and easily. As is normal with dehumidifiers, the ProBreeze 500ml Mini automatically shuts off when the tank is full and also has a full tank LED indicator (which glows yellow when the tank fills up). Like many of the bigger dehumidifiers we have looked at, the ProBreeze 500ml Mini is built to work under conditions of 32 degrees C and 80% relative humidity. So, it should be able to work in most homes where excess humidity is an issue. The only thing that sets this mini dehumidifier apart from the rest is its low extraction rate of 250ml of water per day. For this reason, the dehumidifier does a bang-up job of removing moisture, damp, and mould from the air, in small spaces measuring a maximum of 150 sq ft. If the room is larger than this or too humid, the dehumidifier will not do a satisfactory job. The ProBreeze 500ml Mini does not offer much in way of extra features, except for the fact that it cleans out the air as it draws out moisture. Normally, this would not be a big deal considering almost every other dehumidifier we have featured in our buyer’s guides offers an air filter. However, this mini dehumidifier has something special to offer – a permanent air filter that does not require removal for washing. Moist air goes into the dehumidifier through the air inlets at the front where it undergoes the dehumidifying process before it is blown back into the room with less moisture through the top air outlets. During this process, the air vents trap dust, dust mites, and mould spores allowing fresh healthier air to be blown back into the room. The only maintenance that is required is to dislodge any dirt or debris on the outside of the dehumidifier including air vents regularly using a soft cloth. This should be done with the dehumidifier turned off and disconnected from the mains. Another out-of-the-ordinary thing about this 500ml mini dehumidifier from ProBreeze is that it uses thermo-electric cooling which works differently from the more common compressor and desiccant technologies. With thermo-electric dehumidifiers (better known as Peltier dehumidifiers), there are no coils or large rotating wheel with desiccant chemical built into the unit. Peltier dehumidifiers simply rely on a heat sink that gets cold on one side and hot on the other when charged with electricity. When a Peltier dehumidifier is switched on, a fan (situated at the back of the unit) pulls in moist air, which is then passed over the cold side of the heat sink bringing about dehumidification. The air condenses and the condensate (that is water) drips into a reservoir below. After that, the now dry air is passed over the hot side of the heat sink where it heats up before being released into the room. The beauty with Peltier dehumidifiers is that this thermo-electric technology gives way to 2 great advantages. 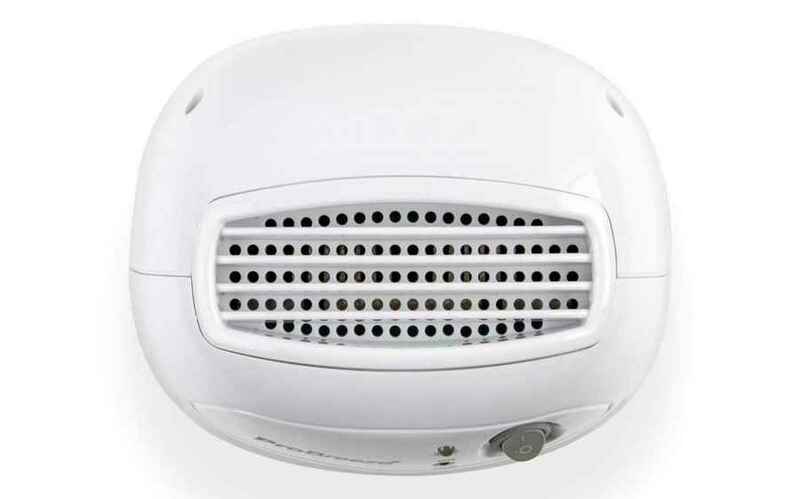 These include 1) whisper quiet operation and 2) energy saving functionality (when used on a small scale like this). As a result, Peltier dehumidifiers use very little electricity with the ProBreeze 500ml Mini operating at only 23watts of power. Compared to other units which run on anywhere between 190 – 200+ watts, this is much lower electricity consumption. The other benefit stems from the fact that since there are no coils or large blower wheels, the only noise from Peltier dehumidifiers comes from the fan. The ProBreeze 500ml mini features a brushless motor with a noise output of only 33dB. With the comfortable baseline for audio placed at 70dB (the equivalent of a vacuum cleaner), 33dB is very quiet standing at about one-sixteenth as loud as a 70dB unit. For a low tank capacity dehumidifier, the ProBreeze 500ml is quite popular, with thousands of customers taking the time to share their experience of using it. What is even more surprising is that a majority of the users have shared positive reviews. Many buyers report that the dehumidifier deals with condensation sufficiently well and draws out a lot of water from the air especially when installed in the small-enclosed spaces it is intended to work in. The dehumidifier’s easy-to-use build, excellent portability, and low hum when running are also highlighted by many users who cite them as the reasons for recommending the dehumidifier to other buyers. 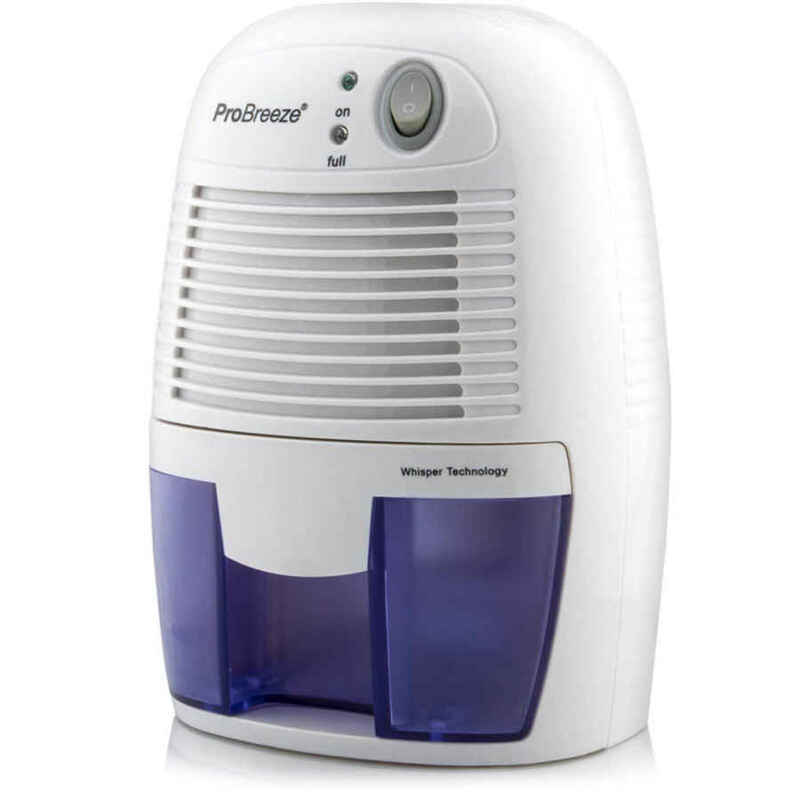 Overall, we have no quarrels with the ProBreeze 500ml dehumidifier. It does the job it was built for and will rid a room of damp, mould, & moisture while throwing in the bonus of creating an allergen-free environment. And, although this ProBreeze unit is not feature-packed, it covers all the basic requirements of a good dehumidifier with its small & light build, extremely quiet operation, and auto shut off functionality. That said, the dehumidifier’s very low extraction rate of 250ml puts it at an obvious disadvantage against other units, which provide capacities of 10L, 12L, 16L, and even 26L of moisture per day. It means the unit will not be effective when placed in a large room that is too humid since it is designed for use in small spaces like an office, kitchen, bathroom, or bedroom. This is something you should keep in mind when considering the ProBreeze 500ml dehumidifier.